You don’t have to let a small budget keep you from getting what you really want or need. That’s why EAST TENNESSEE HVAC & PLUMBING, INC. offers promotional financing options when your purchase is made with a Home Design credit card issued by Synchrony Bank. Synchrony Bank is one of the premier consumer financial services companies in the United States with over 80 years of retail heritage, and today is the largest provider of private label credit cards in the United States². 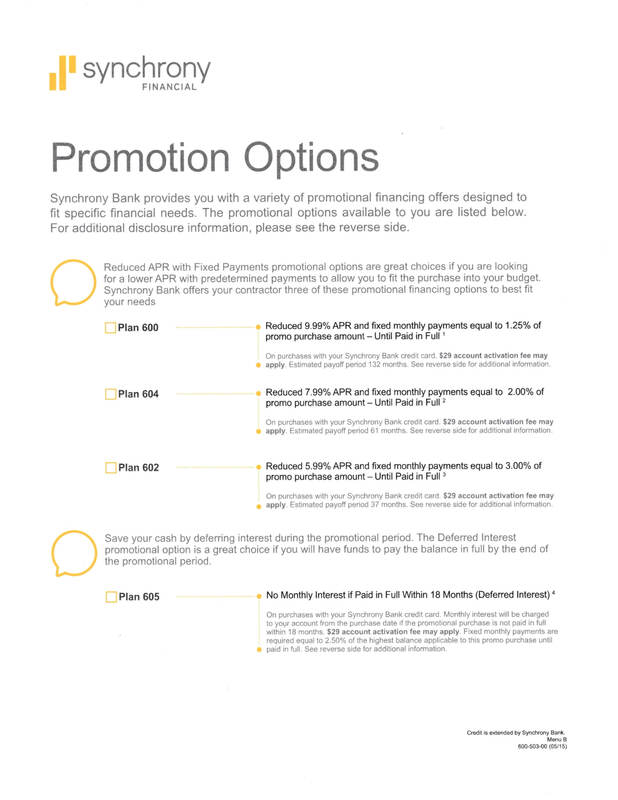 To learn more about promotional financing options from Synchrony Financial, please contact Chandra @ Office@etnhvac.com, or 423-420-6440). ¹ Subject to credit approval. Minimum monthly payments required. See store for details. ² Based on purchase volume and receivables. For all promotions: Qualifying purchase must be made with your HOME DESIGN credit card issued by Synchrony Bank and a $29 account activation fee will apply and be charged at the time first purchase posts to account. For new accounts: Purchase APR is 26.99%; MinimumMonthly Interest Charge is $2. Existing cardholders should see their credit card agreement for their applicable terms. Subject to credit approval.